Summer Bells Sweater is assembled – all that’s left is the front band and buttons. I’m looking forward to seeing it modeled! When you have X number of “every row” or “every-other-row” decreases (along the neckline, at the sleeve/armscye), put a stitch marker X stitches into the row to know when to stop decreases. When you have decreases “every X” rows, put a stitch along the edge at each decrease to keep track of intervals and quantities. Back, Left and Right Front, and one sleeve finished. Second sleeve well on its way to completion. I did a conceptual test-fitting on my daughter (who is also petite) to check that the length was right and to be sure that the “smaller-than-me” size would fit. Knitting nearly complete. Next up – blocking and assembly. Something for my Mom – she really like purple. This is a medium-weight sweater (despite the name – I think my choice of yarn might have something to do with it). Summer Bells Sweater is from Creative Knitting Magazine, May 2010, this is a 3/4 sleeve, slightly below-waist sweater that will suit my Mother’s petite frame. The “bells” at the hemline and sleeves add a feminine touch. Yarn is (again) KnitPicks, this time their Swish DK yarn, 100% superwash Merino Wool, in color Amethyst Heather. I made several swatches, because I was having trouble getting gauge. I think I finally went a needle smaller than the yarn band recommend, but which is consistent with the pattern (go figure – I thought the yarn was a heavier weight). This is a little darker in color than I expected, but I think it will work. I also think it will look a lot better when blocked. New sweater project: Cable Embrace, from KnitPicks. I really like tweed yarn, and I especially like the tweed yarn from KnitPicks. Unusual for me, I purchase the yarn and pattern together, and the yarn with the pattern in mind, and started knitting, as soon as I received it. Yarn is City Tweed DK, in color Brocade. I am enjoying the pattern, with the diagonal cable lines. Back is complete (on the left). Right side is at the arm and neck decreases. All pieces have been knit; ready for blocking and assembly. Last bit will be the band around the neck. I’ve enjoyed this project – the yarn, the pattern, and the color are very pleasing. 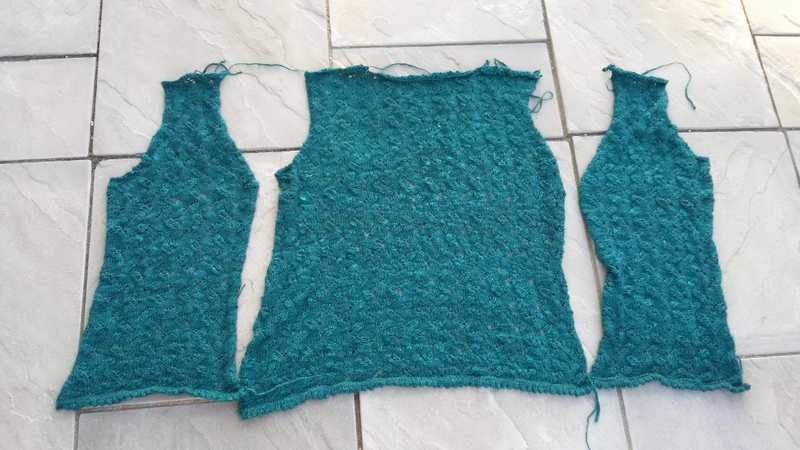 Back and front completed – now time for the sleeves! Closer to the true yarn color. Gotta love morning light in the autumn.